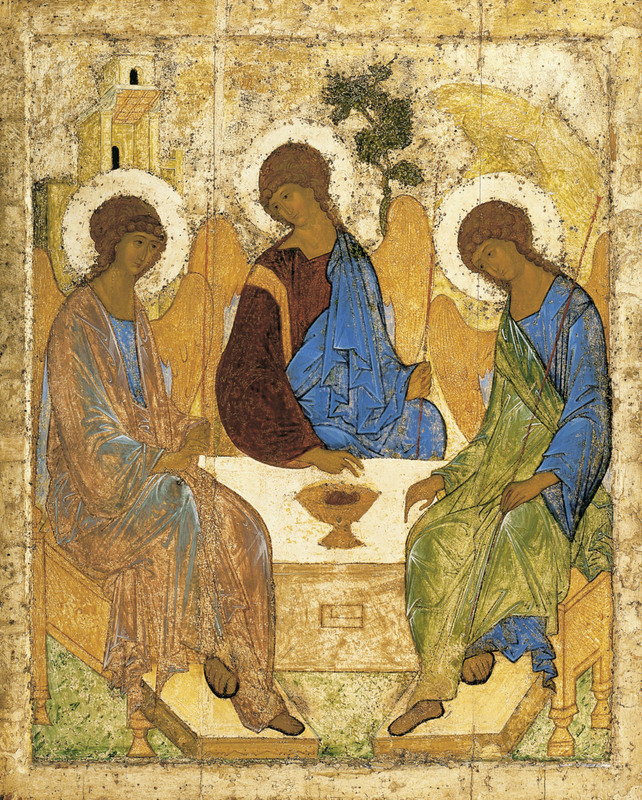 Trinity Sunday ~May 31, 2015 – Rev. Canon Dr. William J. Danaher Jr.
Then at the end he allowed me. He allowed me in such a way that, at the end, he pulled out from his pocket an old envelope, and one more envelope, and one more envelope. He started opening one after the other, and right inside there was a little photograph of his father and he gave that to me to look at. I looked at the photo and I looked at him and I said, “You, you are so like your father.” He was so overjoyed that I could see the resemblance of his father on his face. I blessed the picture and I gave it back to him, and again one envelop, second envelope, third envelope, and the photo went back again in the pocket near his heart. One reason I like this story is that it draws together all of our Scriptures assigned for today. In our reading from Isaiah, the prophet describes an encounter with radical holiness in the sanctuary of the Temple. Likewise, Mother Teresa’s encounter in Bourke provides us with an echo of what holiness looks like when it is experienced in the home. In both places, holiness is a moment of intimacy, grace and transformation, a moment in which the things that cause estrangement, exile and isolation are burned away by the light of God’s presence. In our reading from Romans, St. Paul tells us that we have experienced the “spirit of adoption.” God’s Spirit resides in us so that we become children and “joint heirs with Christ.” Similarly, in the story Mother Teresa told, she and her community adopts the man she visited and share with him the light of Christ, until that Spirit begins to shine from him. In our reading from John, Nichodemus comes to Jesus at night to find the presence of God revealed in Jesus. Jesus speaks to him words that are deeper than metaphors – about new birth, about the Spirit, about heaven and earth, about himself as the Son of God. Likewise, in Mother Teresa’s encounter with the man, the lamp she lit and the care she gave made Christ spiritually present in his life in a powerful way. The light she lit was not only the physical light shining from the lamp, but the spiritual light that shined from the man’s soul. Mother Teresa’s story also sheds light, as it were, on the feast day these readings celebrate, which is the Trinity. That is to say, today we celebrate the mystery of the Trinity as the ultimate revelation of God’s being to the world. In the prayer assigned for today, we are encouraged to worship God’s majesty through the “unity” revealed in the Trinity. What is this unity? For centuries, Christians have struggled to answer this question. Sometimes, these answers can seem overly abstract, but hidden in each, I believe, are matters of life and death. St. Augustine believed that there are images of the Trinity throughout creation. In each, a special kind of unity is revealed. Two examples stand out. The first concerns love. Every relation of love is made up of a three entities – there is the lover, the beloved, and the love between the two. These three aspects are unified and intertwined wherever love exists. Love cannot be abstracted from the lover who gives it and the beloved who receives it. We do not know what kind of lover we are without knowing the kind of love we give one another. We do not know ourselves as beloved without knowing the lover and the love showered upon us. In every love relation, we need to ask three questions in order to know if our love is of God or not. Do I love well? Does my love do justice to my beloved? What is the quality of the love between us? We can also find an emblem of the Trinity, Augustine believed, in the different parts of our soul, which he identified as memory, intellect and will. Here unity takes the form of our identity, which is tied together by the self we remember, the self we know, and the person we will ourselves to be. Like the trinity revealed in love, this triune identity reveals questions we do well to ask ourselves prayerfully. Who am I? How have I lived? Where am I called to be? Emblems of the Trinity not only are apparent in these two examples, St. Augustine believed, but everywhere. Every emblem we find reveals a profound insight about our God, ourselves and our world. In the story Mother Teresa told of her encounter, an emblem of the Trinity emerges when we trace the points at which a father, son and spirit appears in her narrative. An image of the father appears in the photograph the man shared with Mother Teresa. The love the father shared with his son became evident the moment Mother Teresa noticed their family resemblance and blessed the picture before giving it back to the man. The spirit is revealed in her witness to this love and in the lamp that she found in the corner, waiting to be lit. Unifying these elements in the story is a profound moment of mutual hospitality. At its core, to show hospitality is to make room, or provide space, for another. The man made room for Mother Teresa to come into his home, and she made room in her day to show him hospitality by cleaning his house and welcoming him into her world. By continuing to show hospitality to those sisters who kept visiting him, the man experienced a spiritual renewal that come by being hospitable. Like the other two emblems of the Trinity I have discussed, this trinity offers its own teaching on the hospitality we practice. What takes up space in my life? Am I making room for the stranger and neighbors around me? Does my life shine and welcome others? Mother Teresa’s story is not the only example of this emblem’s appearance in the Christian tradition. In 1410, the iconographer Andrei Rublev wrote the following icon I have placed in your bulletins for today. Originally, this icon was called the “Hospitality of Abraham,” and it celebrates a moment recounted in the Book of Genesis (18:1-15) when Moses welcomes three angels who come to visit him by the oaks of Mamre. Abraham serves the visitors an elaborate and generous meal, and the visitors reveal to him that his wife Sarah will conceive and bear a son even though she is past the age when this can naturally happen. Abraham’s hospitality, then, represents an even larger moment of hospitality in this narrative. By making room for the visitors, Abraham discovers that he has made room for God, and that God has already made room for him to be the father of a chosen people. 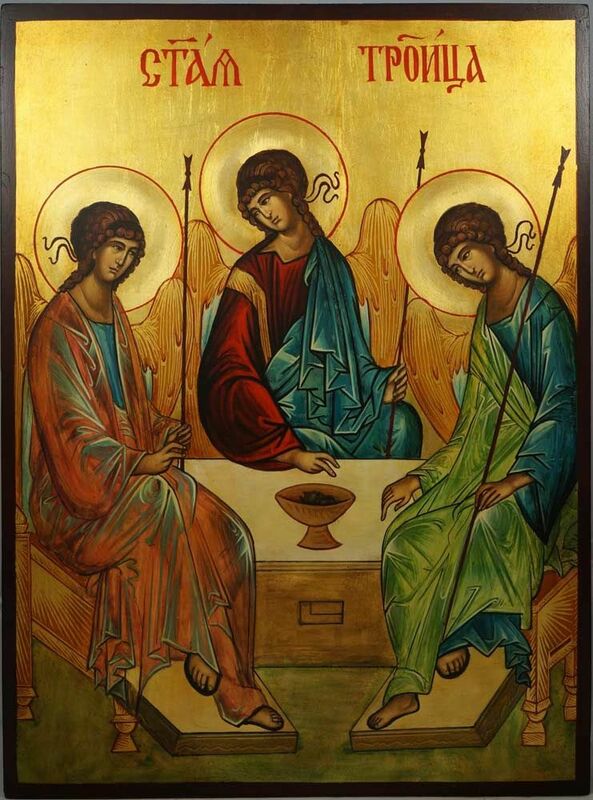 Over time, this icon came to be seen as not only remembering the hospitality Abraham showed to the angels but depicting, in a refracted way, God as the Holy Trinity. Each of the figures holds a rod, signifying the unity and equality between them in terms of dignity and importance. Their identity is revealed in the clothing each wears. The Spirit is seated on the right. She is clothed in light blue and green to symbolize the Spirit’s hovering over the waters at creation but also the new life and light she brings. The Son is seated in the middle, and he is dressed in dark blue and reddish-brown to symbolize the joining of heaven and earth through the Incarnation. He is also blessing the cup on the table before them to symbolize his loving sacrifice for all humanity. The Father is seated on the left, and he is wearing a fabric that seems to shimmer with different colors to symbolize the fact that none of us ever sees the Father except through the Son and the Spirit. Standing in the background of the icon is a house and a tree. These are, at once, the oak under which the Angelic visitors sat by Abraham’s house, and the protection and peace offered to us in this life as we make our way to the house of God. Most importantly, between the three figures in the icon there is a circle of love communicated between the three figures in their eyes. The love of each is evident by following the loving gaze of each. This is an open circle, for Abraham in the original telling of the story, and now for us. Finally, the icon both remembers an act of hospitality and shows hospitality by reminding us that, like Abraham, God has chosen each of us to join the perfect love that comes from this divine circle. What is the measure of your love? What forms your identity? Where do you find, and extend, hospitality in your life? May these questions find their answers in our God, whose infinite love and holiness is revealed in three as one. Amen.